It is a stock image. 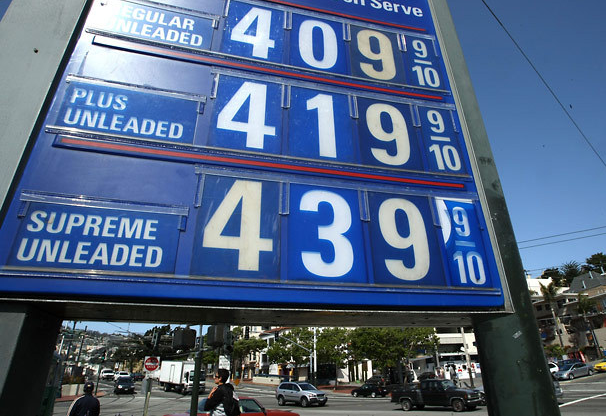 We see it every time there is an abrupt jump in the price of gasoline (which has been a great deal lately). The only thing that changes are the numbers as they move ever higher (always ending in 9/10th of a penny as if that somehow minimizes the impact of the increase.) This sign is in San Francisco, but of course there is nothing in the photograph that would give that away. It could be “Anywhere, USA” for all we know, and that is part of its rhetorical appeal as it functions as a cipher for the state of the national economy. Shot from a low angle, it puts the price of gasoline—and the oil companies that bring it to us—out of reach of ordinary consumers who have little choice but to look up and to pay up. But what is perhaps even more interesting than the billboard which features the price of gasoline, is the social surround that fills out the photograph: there are no long lines of people waiting to buy gasoline; and there are no angry consumers protesting the price or challenging the legitimacy of the cost or price hike. In point of fact, there is nothing that would point to a crisis or serious discontent of any kind as consumers—pedestrians and drivers alike—go about their business calmly and without any apparent concern for the price of fuel. Indeed, if anything, the sheer repetition of stock photographs like this one across time has a normalizing effect on such price increases that suggests that there is really nothing out of the ordinary here. Sure, prices go up, and sometimes it is inconvenient, but it’s happened before and life goes on. And the proof, of course, is in a photograph that we see over and over again. But of course we know that most people are feeling the pinch of increasing fuel costs, especially the most recent spike in prices at the pump—nearly 20% since January 1, 2008—and so we have presidential candidates from both parties advocating a summer gas tax holiday designed to give consumers “much needed financial relief.” The details for how to pay for such a holiday vary, but however it would work the appeal for such a policy smacks of the worst kind of political pandering as it is designed to address short term, personal needs (votes in the coming election and marginally cheaper fuel for individual U.S. consumers/voters) rather than longer term public interests (a sustainable national energy policy in a global economy). And what all of this ignores is one of the primary reasons that we face a problem with rising energy prices: years of excessive and uncontrolled consumption fueled by a normative sense of national entitlement, a belief in the infinite renewability of oil and gas resources, and the assumption that in the end market driven price increases are … well, altogether legitimate and … normal.